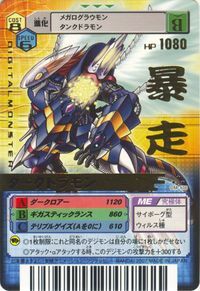 Its Special Move "Dark Roar" is a bold move in which it fires Dark Matter as energy shots, and it is said that there is nothing in this world that can suffer that attack and survive. 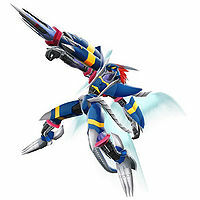 Also, its right hand is equipped with the "Gigastick Lance", which rivals Dukemon's holy lance "Gram". Charges and shoots a giant ball of dark matter. 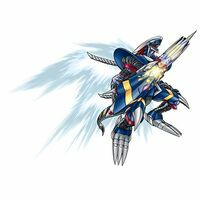 Gigastick Lance  ギガスティックランス Gigasutikku Ransu Giga Stick Lance/Gigantic Lance/Lasers of Light Uses the lance in its right hand to pierce foes. Strikes a powerful blow using the Gigastick Lance. Shoots a strange beam from the eyes on its right gauntlet to numb the enemy. 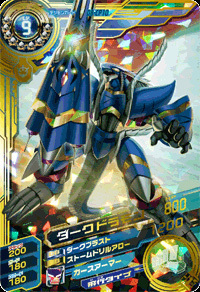 Darkdramon's DigiMemory from Digimon Xros Wars. 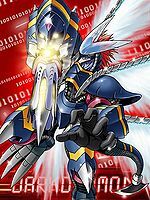 Tsurugi Zenjirou tries to load a Darkdramon DigiMemory into Kudou Taiki's Xros Loader when the group is attacked by Arkadimon Perfect. However, the card fails to load. 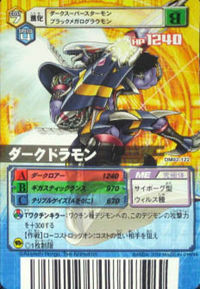 Can be evolved from Were Garurumon if above level 52 and Dragon EXP above 7000. 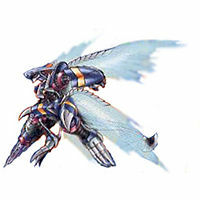 Darkdramon is a optional boss and is playable Digimon that evolves from Blue Meramon. 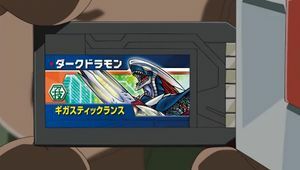 Can be evolved from Megadramon if above level 52, Dark EXP 12000, and Machine EXP 9000, or can be found at Access Glacier if you accomplish the quest mission "The Challenge From Gaia Origin!" from Commander Glare, after you finish the game once. 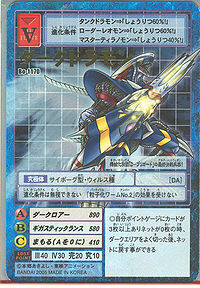 Gigastic Lance: Inflicts 877 to 1094 pitch black-attribute damage with 3 sec cooldown, consuming 53 DS. Obtained at level 41. 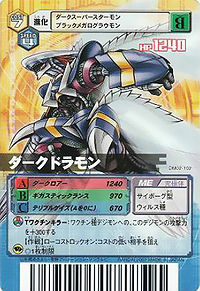 Dark Roar: Inflicts 3060 to 3368 pitch black-attribute damage with 8 sec cooldown, consuming 184 DS. Obtained at level 46. Darkdramon is an obtainable Digimon which is evolved from Megadramon or Megalo Growmon, and can evolve to Chaosmon. It can also be obtained as a collectible card. 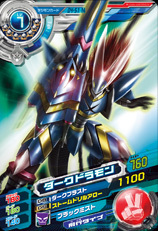 Its card is part of the D-Brigade (D-ブリガード D-Burigādo) set and the Jogress Evolution 1 (ジョグレス進化その１ Joguresu Shinka Sono Ichi) set. 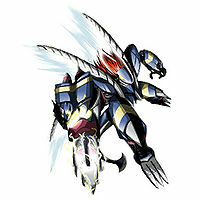 Can be evolved from Angewomon or Tankdramon, or the latter Jogressed with Volcamon. 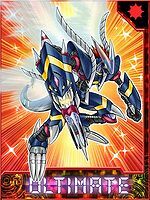 Can Jogress with Bantyo Liomon (Justice Genome), Valdurmon (Nature Genome), or Sleipmon (Ultimate Genome) to evolve into Chaosmon. 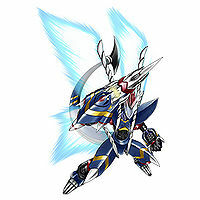 Darkdramon is a 1 hour transformation after the use of Giga Lance. 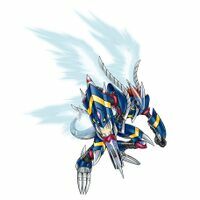 Can be obtained by using the Giga Lance item on any Digimon Child level or above. 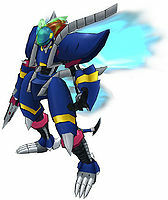 Darkdramon is a DigiMemory that came packaged with the Digimon Xros Loader Blue Flare Side toy. 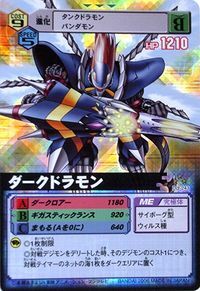 The ultimate weapon of the mechanized D-Brigade! 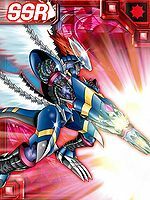 This Digimon is said to be born from a battle-worn Tankdramon that absorbed a large amount of dark matter. 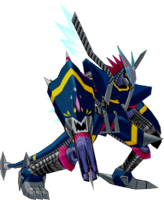 This Digimon is said to have gone berserk and become uncontrollable due to the large amount of dark matter packed inside of it. 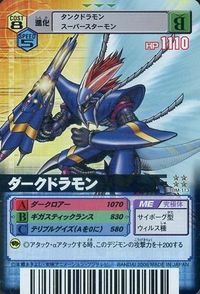 The Gigastic Lance it wields on its right hand has power that rivals that of Dukemon's holy lance Gram.